If the headline didn’t clue you in, this story has SPOILERS for those who haven’t watched Edge of Tomorrow yet, and shame on you if you for that. 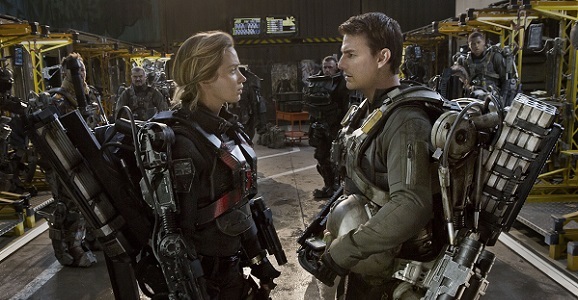 Save for a relatively small crowd of non-fans, Doug Liman’s Edge of Tomorrow is one of the most critically acclaimed blockbusters in recent years. Such a distinction, even when coupled with positive word of mouth, has done almost nothing to help its domestic earnings—it’s currently earned $86 million here in the States. Thankfully, the film’s box office will end up nearly as positively, with over $234 million brought in internationally. Speaking of happy endings, not everyone was fond of Tom Cruise’s tongue-in-cheek smile that capped off what we assume is the story’s final time jump. As you can imagine, it wasn’t always supposed to be so upbeat. In reference to the people who complained about it, he says, “I think the only way to make those people happy would be to end the movie in a way that wasn’t happy. We weren’t interested in doing that. It needed to end in a way that wasn’t harsh.” Considering just how bleak tentpole films have gotten in the last decade, the GFR crew is perfectly happy with the wry jab at the end, which fits in nicely with the rest of the film’s tone. Consider, if you will, the following explanation for the original third act, which would have taken things in a completely different and not uninvited direction. When Tom loses the power, and they go to Paris, and Tom is preparing the team as they go into Paris where he’s telling them the rules of the movie, he tells the team everything the audience knows…Basically, he told them: ‘Kill as many Mimics as you want, but do not kill an Alpha. If you kill an alpha we’ll be right back here having this conversation, and we won’t even know it. The enemy will know we’re coming and they’ll kill us all.’ When they get to Paris there’s the classic horror movie scene where one of them gets separated from the group, and he gets attacked by an Alpha and kills it. As he kills it, you see the Omega reset the day and you see the point-of-view of the villain. We cut to the plane and hear the same speech all over again. This time when he gets to the line, ‘You can bet they’ll have a plan to kill us all,’ the ship gets hit. As the audience, you realize the enemy knows they’re coming. The problem was you were so exhausted by the time you got to that point. Though I like the cleverness behind a consistently looping timeline, I don’t know how I would have felt about that being the actual climax. I guess it’s good that I don’t have to worry about it. Hopefully McQuarrie will share more stories like this on the Blu-ray, whenever that ends up hitting stores.